Now let’s get on with the recipe! I’m not kidding you guys, I even surprised myself with how good this was (haha) – I’ve made mojitos several times before but this one BLEW ME AWAY. 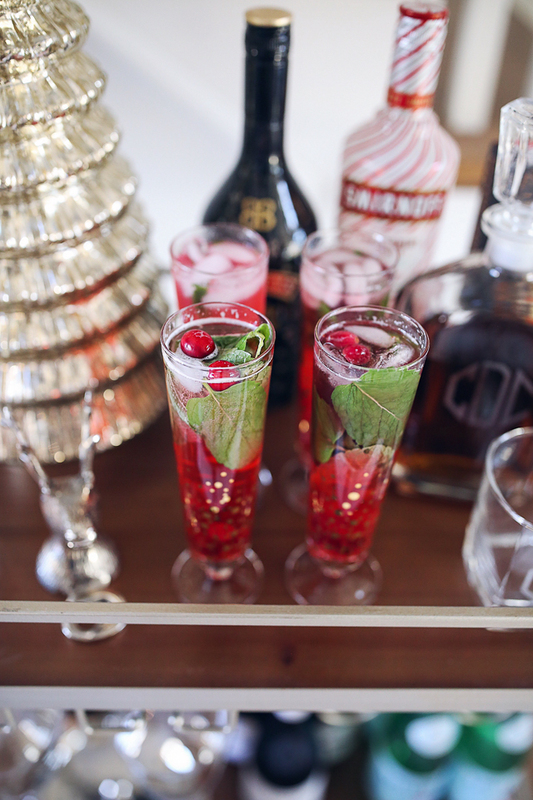 The mix of cranberry, lime and mint is both refreshing and beyond perfect for a holiday party. The recipe isn’t hard either – these took less than 20 minutes to make. This recipe makes enough for four drinks, so if you’re making it for a party you can double or triple the recipe, depending on the amount of people. 1. In a medium sized sauce pot, add cranberries, sugar and water. Turn the stove on medium heat and let simmer for about 10 minutes. You do not want the mixture to boil or the cranberries to burst. After all the sugar is incorporated and the mixture takes on a pink hue, take it off the burner and let it cool to room temperature. 2. 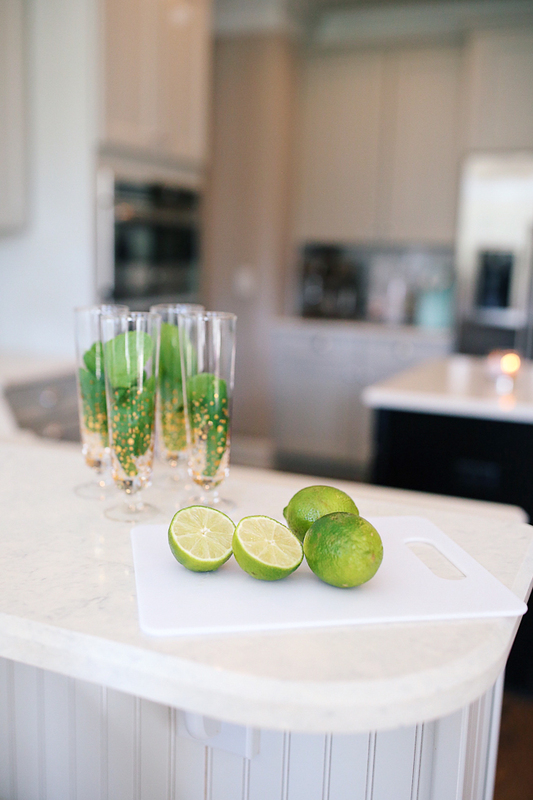 In each glass, add mint leaves and lime juice and muddle slightly to release the mint flavor. Fill the glass with ice. 3. 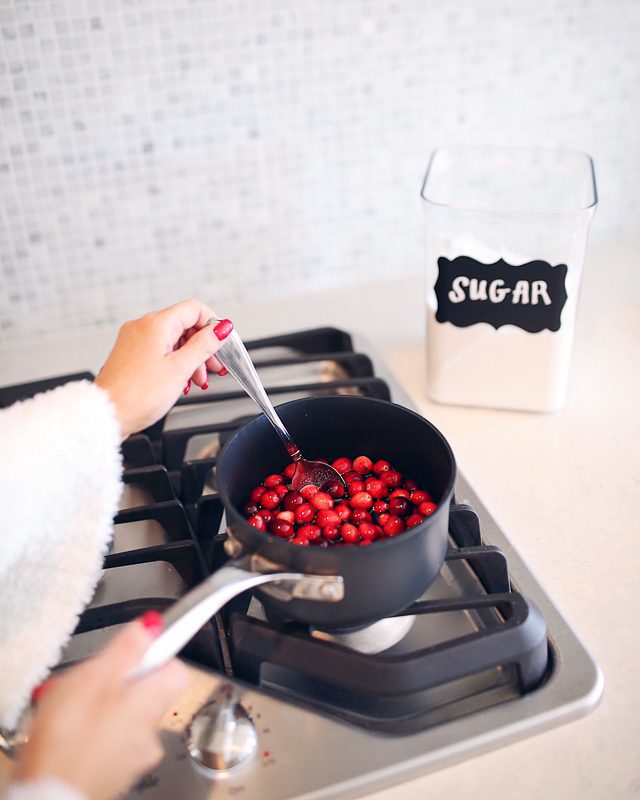 Once the cranberry simple syrup is cool, fill each glass with 2 ounces of cranberry simple syrup and 2 ounces rum. Top with seltzer water and add some fresh cranberries for garnish. Let me know if you guys make this! I’d love to hear your thoughts! That drink sounds SO YUMMY! I need to make that asap! 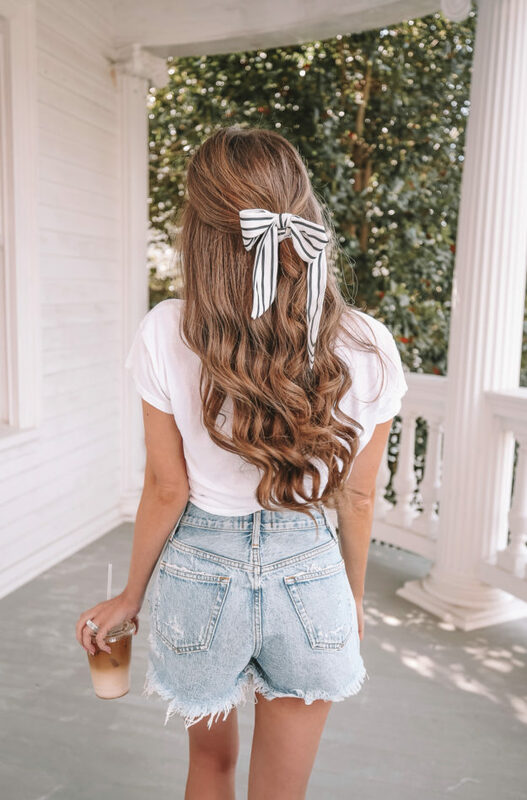 You are looking so glamorous in this cute outfit! Your sparkling skirt is perfect piece for the upcoming festive season! First of all, LOVE the skirt! And this recipe looks great! http://trendkeeper.me .. Winter Blues & a GIVEAWAY for Black Friday! Hey Anne! I'm wearing an XS 🙂 Have a great weekend!! 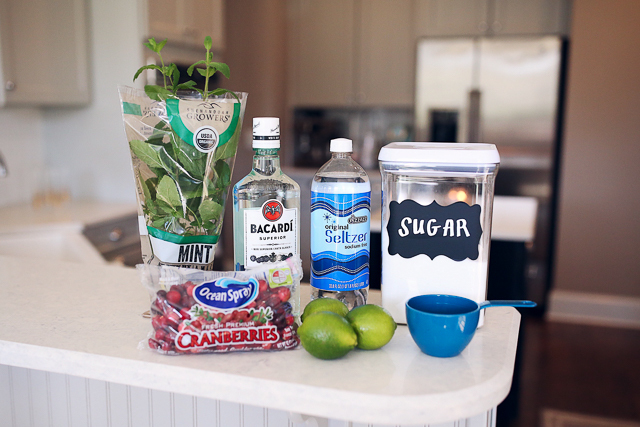 Definitely saving this drink recipe- Mojitos are my fav! I'm so excited to shop Express on Black Friday, it's on of few stores we have here in Vermont haha! Hi Caitlin! Where is your kitchen rug from?! 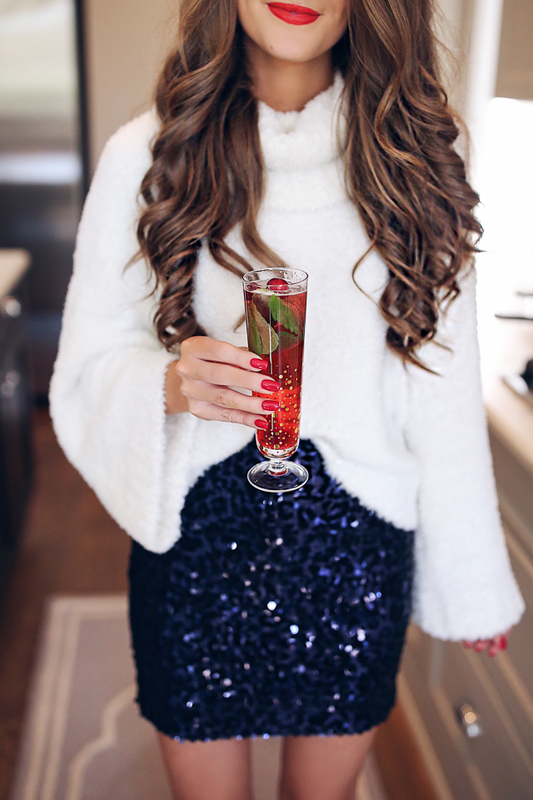 That sweater looks so cozy and love it pared with the sequin skirt! The recipe sounds lovely! I love mojito so I really have to try that! I am loving your holiday posts. Thank skirt is to die for! 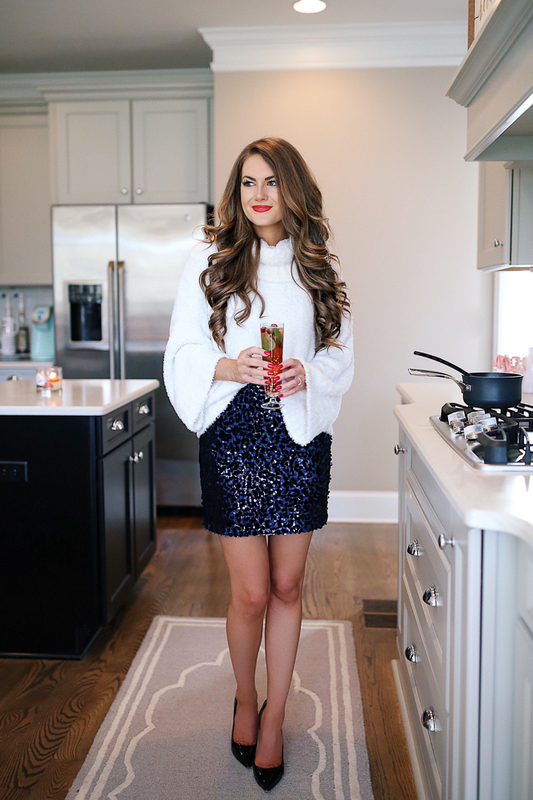 Drink sounds fab – love that skirt! Loving the skirt! I love mojitos so this will definitely be worth a try for me! Looks so good!! That looks like the perfect holiday drink! I love your style!! Your look is always effortless. You are one of my inspirations to start my own blog. This sounds like the perfect holiday drink! Definitely going to try This! Where did you get those gorgeous cups?! Definitely going to try these! Where did you get those gorgeous glasses?! I bought extra cranberries just in case. Now I am so glad I did! Thanks for sharing. That lipstick is your colour! It's beautiful on you. This looks like such a fun & fab drink to make. Sooo cute! I love this second photo. 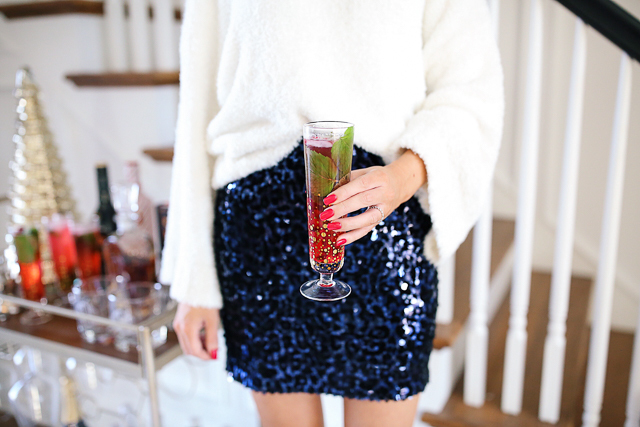 Sequins and knitwear works so well and this drink sounds delicious! I can't wait to try this recipe for my Christmas party. Where did you get your glasses? 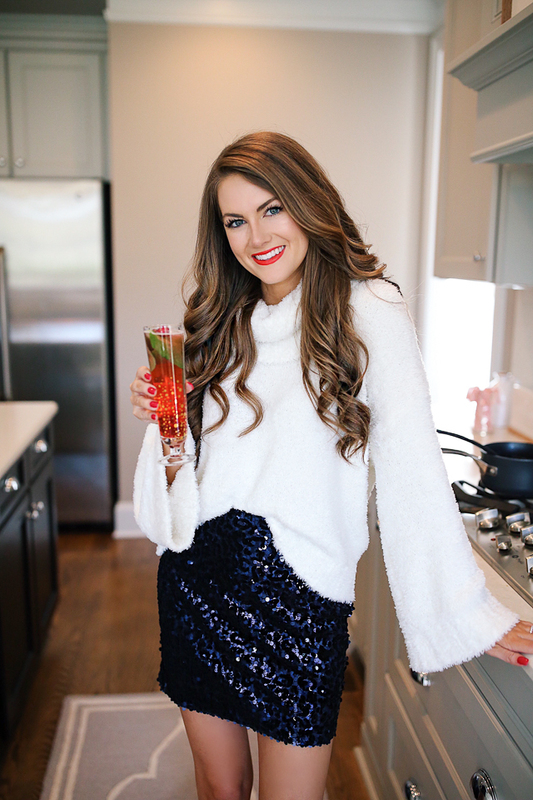 I've been on the hunt for the perfect drink recipe for my holiday party this upcoming weekend…I think I found a winner-this one looks so pretty and sounds like it would be tasty! 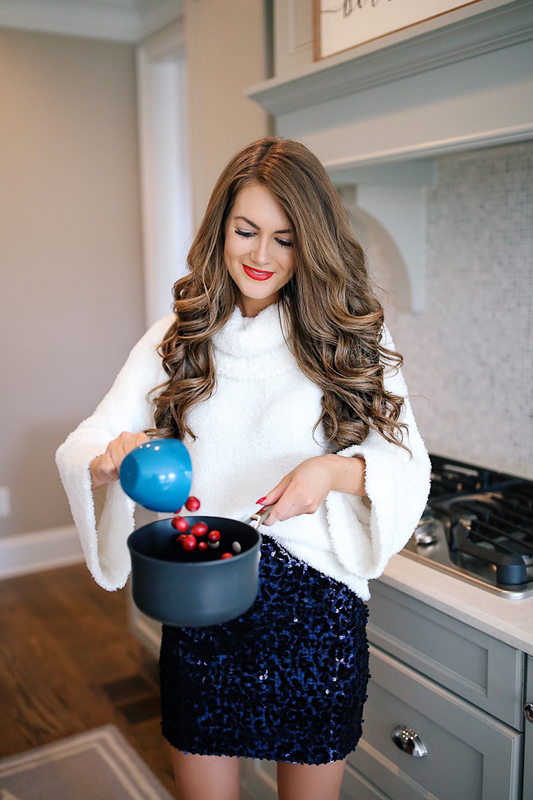 Wanted to let you know I tried the cranberry mojito cocktail for a Christmas party and it was a hit! Thank you for the suggestion! Also, I really enjoy reading your blog-lots of great ideas. Just as an add on to the mojito comment, I used lemon lime seltzer and it was also delicious. that looks delicious!!!!! I must try it. And wow are you ever just gorgeous!! Can you please tell me where i can purchase your sweater? It’s unique and would be perfect for a New Years party I’m attending. Thank you so much.